Think you don’t have time for adopting a mindful practice this winter? 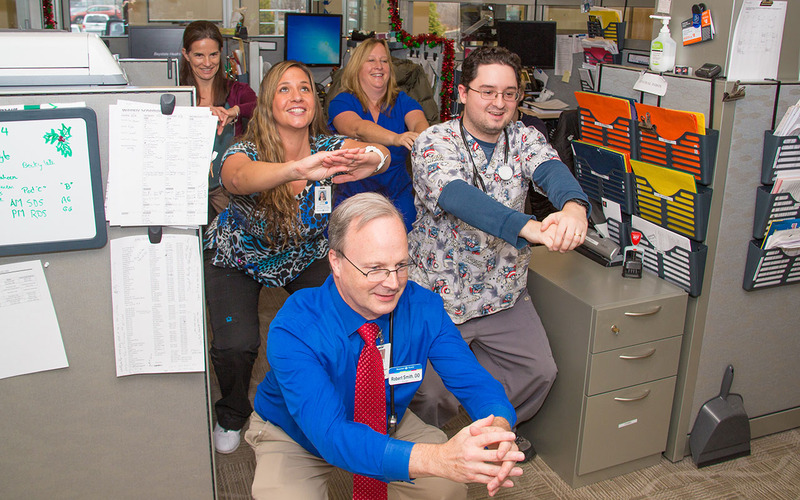 Dr. Robert Smith, director of Baystate Health’s mindfulness programs, offers five mindful practices that fit right into your busy schedule. Winter isn't coming. It's here. And yes, it can be a difficult season. The shorter days, limited sunlight, and increased time spent indoors can be like a perfect storm for stress, unhealthy habits, and – sometimes – seasonal affective disorder. But winter can also be a way to reboot for spring: to restart and restore. It can be an opportunity to minimize distractions, seek self-awareness, and consider what has been achieved over the last year. Think you don’t have time for adopting a mindful practice? 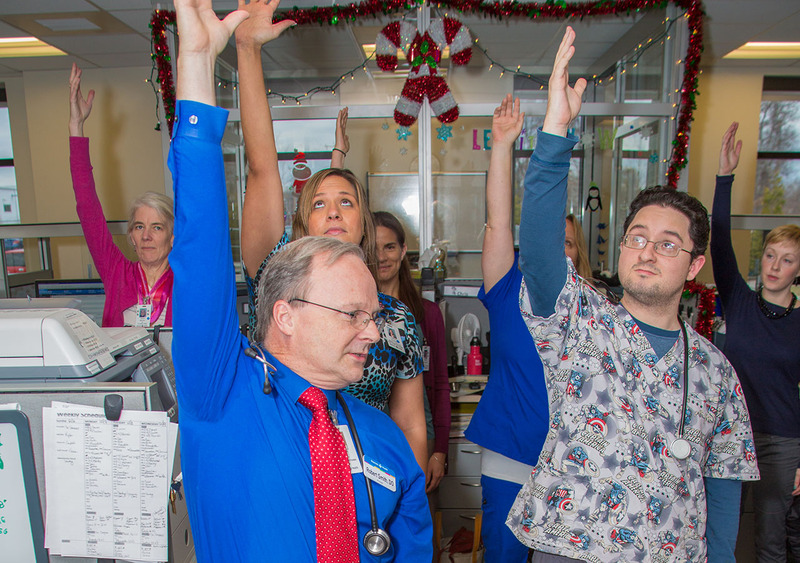 These five tips from Dr. Robert Smith, director of Baystate Health’s mindfulness programs, can help you reduce stress and feel better throughout the winter. Read on to find out how mindful practices can fit right into your busy schedule. Dr. Smith defines mindfulness as “paying attention to the present moment with a particular attitude, one of interest and curiosity.” He emphasizes that our expectations often account for much of what we find stressful. For example, we expect stressful situations and anticipate the way our day might play out. We get up in the morning thinking about stress at work, or the colder days outside, or the early dark. By default, we keep our attention focused on anticipated stressors. But if we shift our attention to noticing the details in our environment and in the present moment, we can have a different experience. After all, "connecting with nature is a wonderful way of helping us re-balance ourselves" Try intentionally observing what is happening around you. Then notice your body relax a little bit. Knowing that the winter months can bring with them certain stressors – and fewer opportunities for exercise outdoors – it is important to counteract seasonal stress proactively. 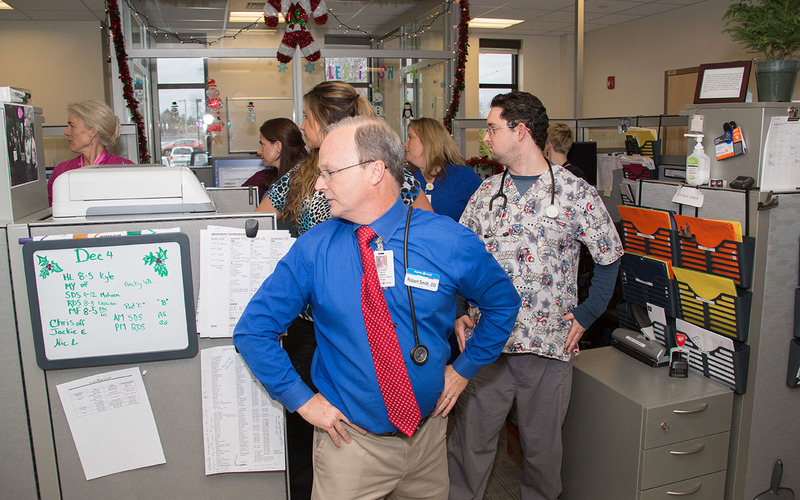 Dr. Smith recommends approaching the seasonal shift with interest and curiosity, noting the details and differences (whether they are negative or positive). Be mindful of the tension that you feel, and recognize that you have a choice in where you focus your attention. The shorter winter days also bring with them increased exposure to artificial light. Our bodies have a natural rhythm, and our routines shift as the seasons change. Your body’s circadian rhythm, linked to the light-dark cycle, can get thrown off as it receives different cues. 3. Don’t try to relax. There is not a lot of benefit in trying to relax, because often your body reacts. “Your body will say ‘no, you should be tense, because there is something wrong.’” Normalizing your reactions to stress and seasonal change, and having compassion for yourself, can help you relax more naturally. Consider the winter as a time for taking extra care of yourself. 4. Be attentive to your body. If you are stressed, your muscles can gradually tighten up throughout the day without you noticing. Pay attention to the way you hold your body. Are you hunched forward, or sitting up straight? Are your shoulders tense and tight, or relaxed and even? We often don’t realize that our bodies are in distress if we do not tend to our physical state. If you hold your body in a defensive or hunched posture, you can find yourself exhausted at the end of the day. 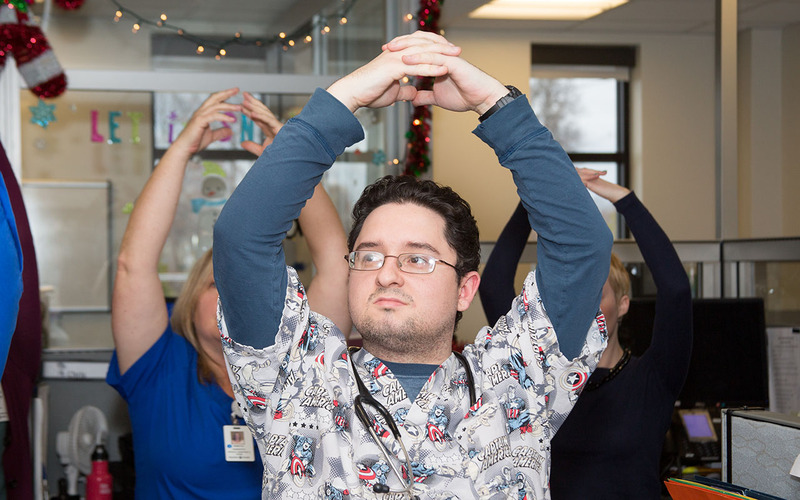 Dr. Smith recommends incorporating mindful movement into your routine (see some photos of Dr Smith leading the Northampton Outpatient Center staff through a series of stretches, below). Mindful movement is like stretching, but unlike other physical exercise, you are not trying to achieve anything. You are simply noticing what it feels like to stretch the body. Stretching also helps to open your mind and take it away from its narrow focus. 5. STOP for a few minutes each day. Take a breath (paying attention to the sensations of breathing for a few breaths or for 1-3 minutes). Observe (as this simple shift in focus to the breath literally opens the prefrontal cortex to a much wider experience of what is really present in the moment). Proceed (from a more open grounded and resourceful place). 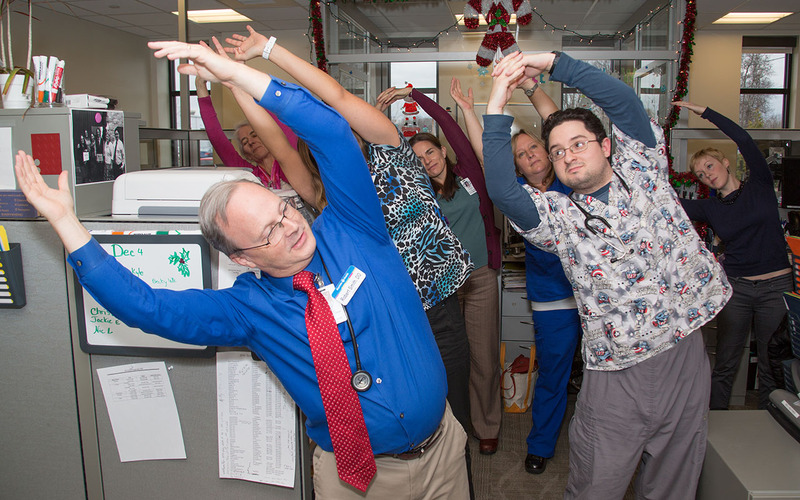 Robert Smith, DO, is director of Baystate Health’s Mindfulness programs. He is a senior teacher for Oasis Professional Education Programs at the Center for Mindfulness in Medicine, Health Care, and Society at the University of Massachusetts Medical School, and he is an Assistant Clinical Professor of Family Medicine at Tufts University School of Medicine. Dr. Smith trains mindfulness teachers, and has taught mindfulness practice to thousands of participants worldwide. He brings over forty years of contemplative practice experience to his teaching. Dr. Smith also practices Family Medicine in Northampton, Massachusetts.